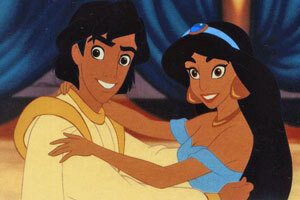 Princess Jasmine party theme is ideal for girls who like Aladdin movies. Use ideas from this page to throw a fun party. You have several options for creating your Princess Jasmine party invitations. Add the date and time, as well as other party details. Ask your guests to RSVP. Then roll your invitations into scrolls, and tie them up using golden satin ribbons. Hand deliver the invitations to the guests. For a different idea, you can take a photo of your daughter wearing a Princess Jasmine costume and a tiara. Then print the picture on the front of the invitation cards. Your daughter will feel very special! Lastly, you can find a group image of the Aladdin movie characters and use that picture for the invites. You can get an inexpensive Princess Jasmine standee and place it in the party area. Put up pictures of a desert and old Arabic cities, tigers or peacocks. Place exotic looking plastic snakes and fake jewels on the floor, along with a “genie lamp” (if you can get something that resembles it). Use several coffee tables, or place a board on milk crates and cover it with a royal looking cloth. That way the kids can eat sitting on the carpet. Have wine glasses at each setting, and place a vase with chocolate covered coins for a centerpiece. Spread out some Mardi Gras type bead necklaces. Hang a “Happy Birthday” banner in a prominent spot. *Royal Transformations: As your guests arrive, turn them into princesses and princes. For the girls, put on some make-up on their cheeks and give plastic tiaras, necklaces, bracelets (or face veils and hip scarves). If boys are attending the party, then hand them paper crowns and other “royal” jewels. *Royal Fans: Invite the kids to design their own fans. Get them to draw creative pictures on one or both sides of colored paper. Next, they need to fold the paper accordion style. Finally, help them fasten one end with tape and gently spread out the other end for a unique looking fan. *Coloring Pages: If you’re throwing a Princess Jasmine birthday party for a younger group of kids, then they can color Aladdin theme coloring pages (available on Disney website) with crayons and pencils. For favors you can purchase such items as tiaras, necklaces, bracelets, fake jewels, hair accessories, face veils, hip scarves, pens, and Aladdin stickers and posters. *Treasure Hunt: Before the party, hide some fake coins and other jewels in the area. Get the kids to find the treasure. Offer clues and hints. This game is especially useful if you have boys in attendance. At activity time, tape one piece of paper on each child’s back without them looking. Get the kids to guess who they’re by asking everyone else Yes or No questions. They might ask: “Am I one of the animals from the show?” or “Am I a member of the Sultan’s Royal family?”, etc. *Musical Genie Lamp: For this game, you can use a toy tea pot from tea party set, or you could purchase an expensive Aladdin genie lamp favor item. Get the kids to sit in a circle. They have to pass the “lamp” as music is playing. When the music stops, the person holding the lamp goes out of the circle and receives a prize. Keep playing until there is only one person left. *Balancing Act: Test young girls’ gracefulness by letting them walk from one side of the room to another balancing a book on their head. Increase difficulty by bringing books of various sizes. Play classical music during this game. *Abu, Abu, Iago: At Princess Jasmine party, classic Duck, Duck, Goose game takes on a new name. *Candy Necklaces: Here is a great craft that your guests will love. Fill several bowls with doughnut-shaped candy and cereal (the ones you can string through – Lifesavers, Cheerios, etc.). Give each child a necklace string, and get them to make their own edible necklaces. *Arab Night Dress-up: Place two boxes with oversized clothing items on opposite sides of the room. You can put in such items as baggy pants and T-shirts, extra-large jackets, shirts, hats and so on (the bigger and the more outrageous the clothes are, the better). Play upbeat party music and have the children walk around in a circle in the middle of the room. As you stop the music, they must run to one of the boxes and put on a piece of clothing. Then they go back and start moving in the circle again. Keep playing in similar fashion until all the clothing items have been put on. *Abu Balloon Stomp: This activity allows the kids to monkey around a bit. Before the party, blow up one balloon per child (have some extra spares just in case). At play time, tie the balloon to the kids’ ankles leaving about a foot of string between the balloon and ankle. The players will stomp on each others’ balloons while trying to keep their own balloons intact. The last person with his or her balloon holding up, wins. *Watch the Show: At the end of the Aladdin theme party, invite the kids to watch an episode from the show. *Princess Jasmine Cake: Bake a regular sheet cake. Find a high quality picture of Jasmine. Outline the cake using the picture as a guide. Fill the colored sections using piping bag. *Star Sandwiches: Prepare sandwiches using your child’s favorite fillings. Use knife, or better yet star shaped cookie cutters to turn the sandwiches into star shapes. *Royal Pizza: Use cookie cutters to cut pizza into fun shapes as well. *Princess Chocolate Berries: Serve strawberries with chocolate. *Jasmine’s Parfait: Fill plastic cups with several layers of yogurt, granola, nuts, and fresh fruit. Top with whipping cream and serve with long spoons. *Cute Rice Krispies: Prepare Rice Krispie treats according to recipe. Cut them in star and heart shapes. *Princess Jasmine Punch: For this recipe, you’ll need a package of frozen blueberries or strawberries. Thaw the berries for some time. Puree fruit in a blender and mix with lime juice concentrate (out of a 12 oz can). Chill the mixture for about 1 hour. Next, add 30 oz of ginger ale, 30 oz of club soda, and 1 pint of vanilla ice cream.